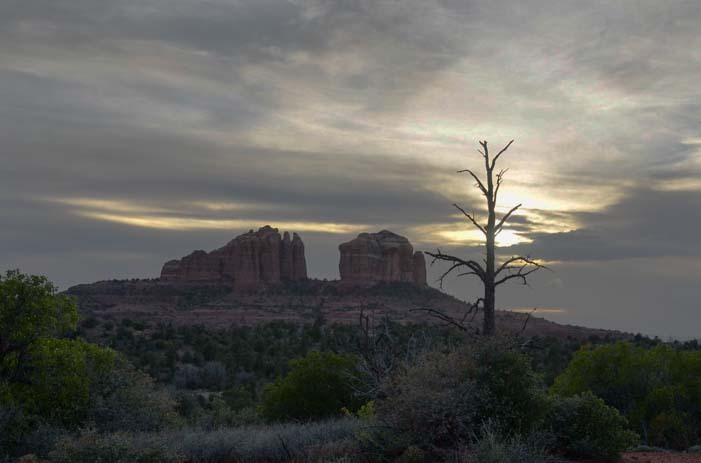 March 2016 – During our RV travels to Sedona, Arizona, we were eager to capture a gorgeous sunset over the red rocks. 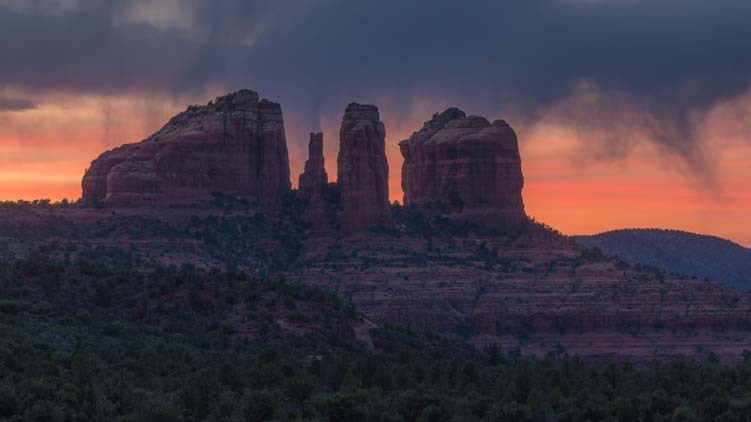 We had seen some lovely sunsets, and we had enjoyed lots of time hiking and biking in the red rocks, so it only made sense that we should be able to get some photos of a magical sunset casting a pink and orange glow across the unique Sedona landscape. We checked what time sunset was, got all our photography gear together, and headed out at the Golden Hour just before the sun went down. We had everything we needed to capture the ethereal light of sunset. 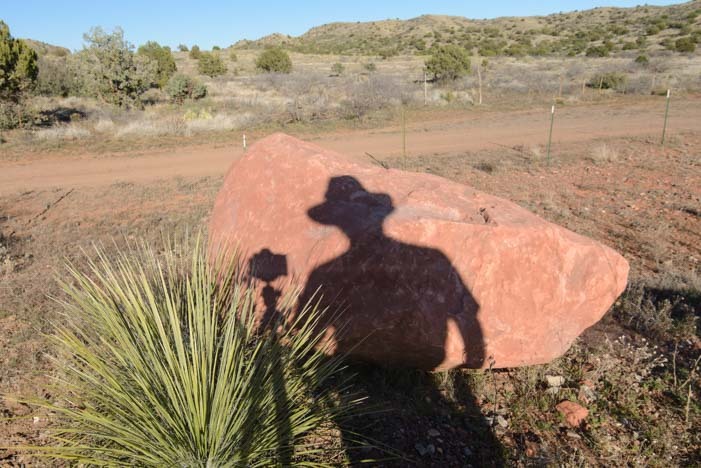 We hiked well out onto the Bell Rock Pathway to the big flat boulders in the middle where you get a wonderful 360 degree view of the majestic red rocks all around you. Would the brooding sky grace us with a beautiful sunset tonight? Well, a daytime sky full of clouds doesn’t always translate into an evening sky full of pink and orange colors. Dark gray and pure white clouds striped the sky. I had found an awesome spot to capture a vividly colorful sky with a craggy old tree framed by the red rocks, but as the minutes ticked by after the sun was gone from the sky, we both finally had to admit that this evening’s sunset was a total dud. Oh well. Despite all the good looking prospects beforehand, the sunset never materialized. We packed up our gear and went home. As we drove, we bolstered our rather dejected spirits with hopes for a stunning sunset tomorrow. After all, Nature would have to put on a vivid display the next night. There couldn’t be two dud sunsets in a row, could there? 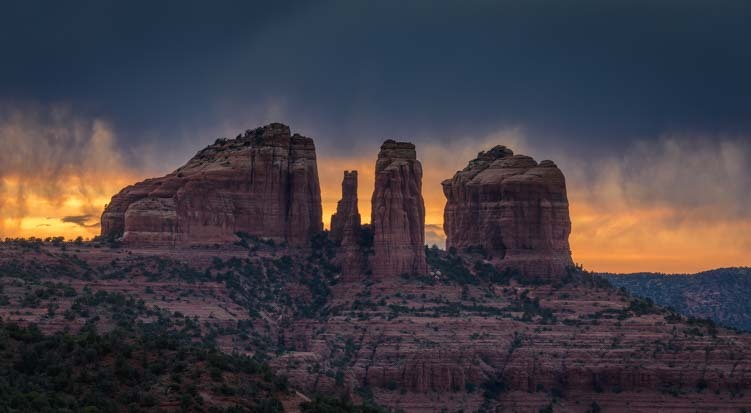 So, after a day of other activites and much anticipation, we packed up our camera gear once again, hopped in the truck, and drove out to the Bell Rock Pathway for the Golden Hour a second time, our spirits high and hopeful. Tripods at the ready, we had everything we needed for a great sunset, provided Nature cooperated! We had expected to see big crowds at the trailheads at sunset, but instead there were just a few vehicles. 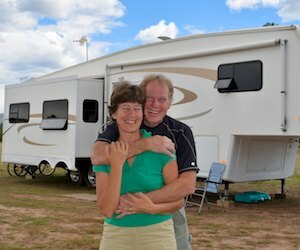 Some kids in a rental RV were climbing on the roof to get a shot of Bell Rock. They flashed peace signs at me and gave me a thumbs up. 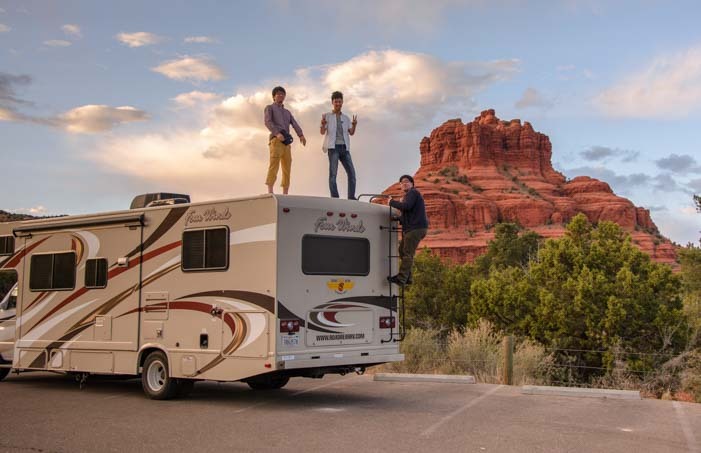 Some Asian kids with a rental RV get shots of Bell Rock from the roof. Just behind us, a girl in a beautiful pink gown was posing for a photographer. How fun!! 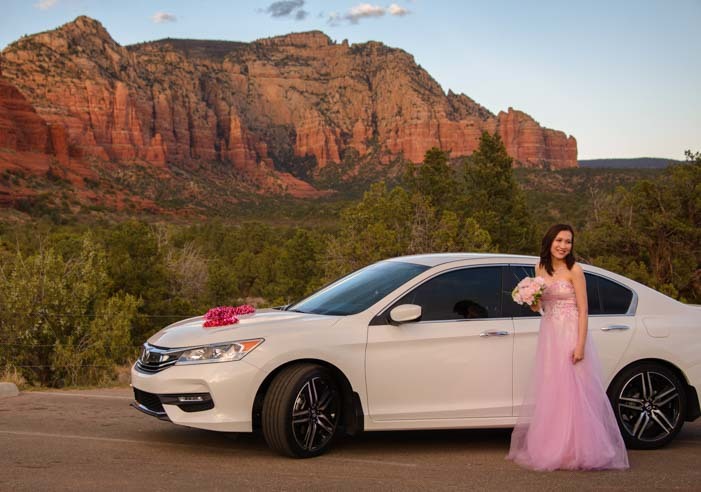 A pink gown and Sedona’s red rocks — what a great combo! Mark posed for me too, although his outfit wasn’t quite as stunning, and the skies began to go gray above us. We stared at the darkening, mottled sky wondering how this sunset would go. Hmmm. Well, maybe a sunset would develop. We hoisted our tripods over our shoulders and trekked out onto Bell Rock Pathway once again. To get a good sunset, there has to be some kind of small opening in the sky at the horizon where the sun can shine through and light up the clouds as it slips away. We watched with disappointment as the entire horizon filled with dark, dense, gray clouds, obliterating any chances the sun might have had to peek through. Very cool clouds, but no sunset. We had our trusty radios with us, and we kept each other entertained with banter while we waited, even though we were on opposite sides of the huge rocks. Eventually, the clouds and nighttime won, and the last shafts of light from the sun flashed across the sky. The sky went black, and our spirits went the same way. We couldn’t believe our luck. Two days in a row! Stubbornly, we stayed put out on the trail until the trail itself was impossible to see, as if by remaining out there we could make the last half hour replay itself, this time with bright color and a vivid sunset. The sun splashed across the clouds for a split second before darkness fell. We were very quiet in the trailer that night as we sorted through our photos. Would we give it a try again tomorrow? The third time’s a charm… but then, bad things come in threes. Oh goodness. The thing was that these nights were COLD. 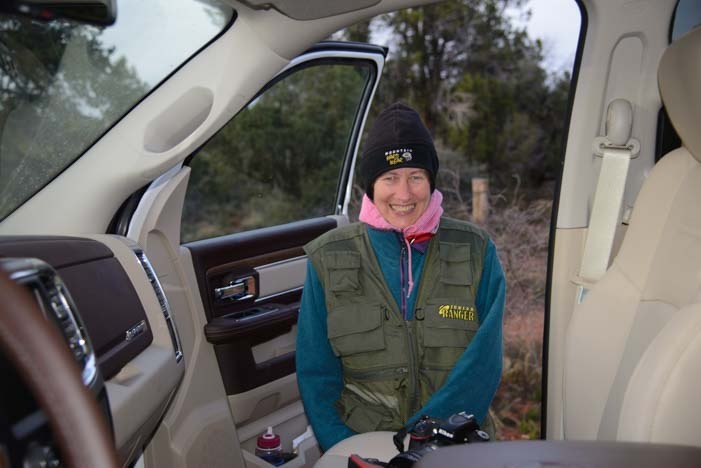 We each wore three jackets when we hiked out onto the trail, and the wind always found its way through our clothes, even when we snugged our hats and hoods around our ears while waiting for the sun to do its magic. 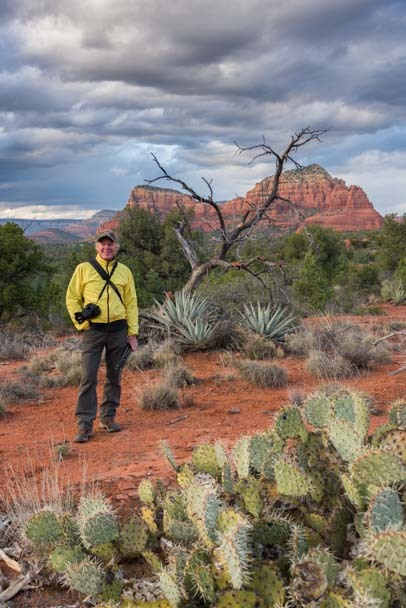 Staying warm at sunset in Sedona in early Mark takes a lot of layers!! On the third day there were puffy little idyllic happy clouds in the sky all day long. Huge platoons of them marched across the sky, and they promised us they’d still be marching come nightfall so we could photograph glorious shades of magenta and orange suspended over the red rocks. 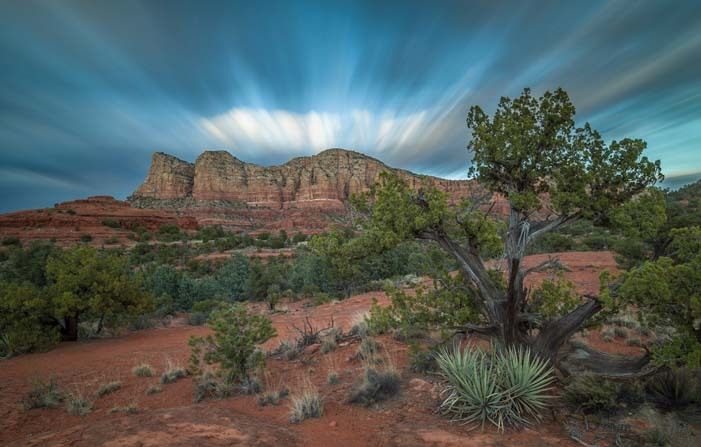 Clouds streak over Cathedral Rock. By sunset the clouds had banded together into massive blankets of gray that streaked across the sky. The streaks over Cathedral Rock take on a wild look. They swam from horizon to horizon, and even when the sun was able to cast its warming glow for a split second, the clouds hung heavy and dark. Sun lights the sky for a fleeting moment. Mark got creative, though, and caught them in the act of coming directly towards him over the cliffs in the distance. But the color just wasn’t happening. 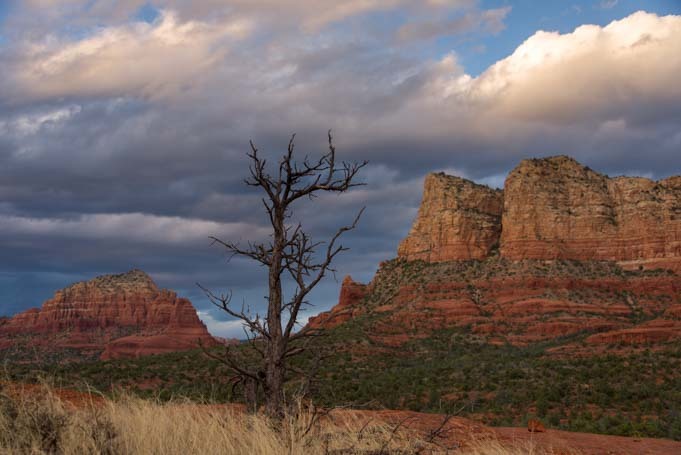 The gods of the Sedona skies had decided not to give us any orange or pink brilliance for the third night in a row. Suddenly, just as we were giving up hope and talking about packing it up so we could go home and get warm, we turned around and saw fire lighting the sky beneath the dramatic clouds hanging over Cathedral Rock. The sky is on fire at the base of Cathedral Rock. “Holy cow. Do you see THAT?” I called on the radio. “YES!” Mark answered. And we both leaped into action. 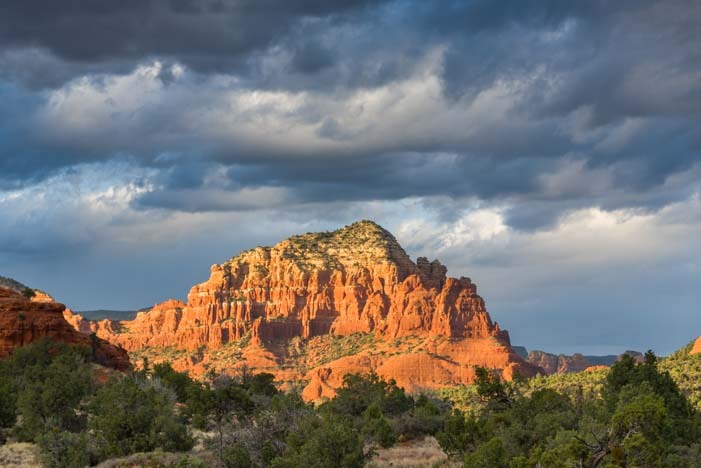 At last we had our colorful sunset skies over the red rocks in Sedona. 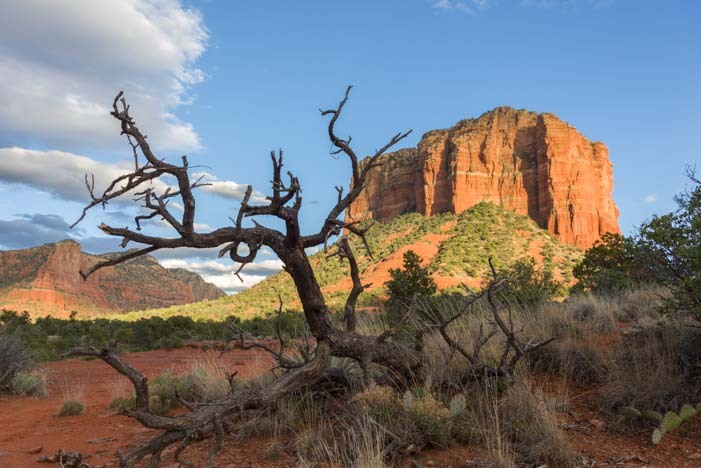 If you are traveling in your RV to Arizona’s red rock country in Sedona, try to get out on a hike during the golden hour for sunset. Even if you don’t get a wildly colorful sky, you will still see a lot of beauty. And who knows, at the very last moment the sun might do something magical! Each of the three nights we ventured onto Bell Rock Pathway from a different access point. The three trailhead parking lots can be found on Google Maps at this link. 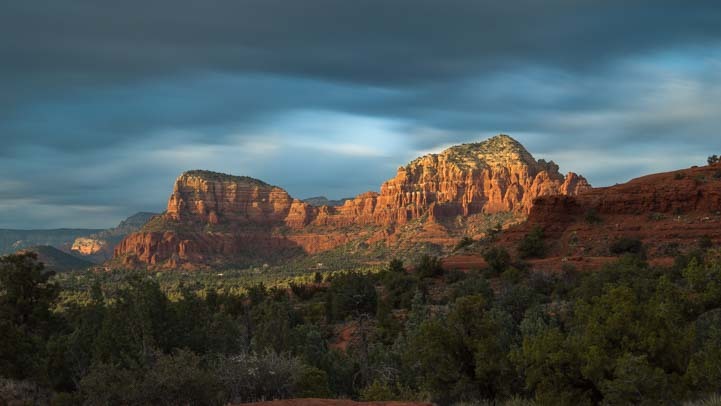 This entry was posted in Arizona and tagged Arizona, New, Sedona Arizona, Travel, USA, WP Travel by Roads Less Traveled. Bookmark the permalink. Sounds great, Ken. You’ll be off and running before you know it. Good luck and have a blast! Love all the pictures! We traveled to Sedona 5 years ago. First time. Took highway from I40 south in a 38ft MH. What a scary, eye opening drive. Finally got to the bottom just at dusk. “No room at the Inn” Managed to get a spot about 15 miles west if we would agree to a 2hr sales pitch. Had our electric bikes with us so rode them into Sedona. It was all worth it. Your pictures make us want to go back again. This time I will come from the south to spare my heart. You must be talking about route 89A through Oak Creek Canyon. That is a stunningly gorgeous road, but it sure is steep and twisty! 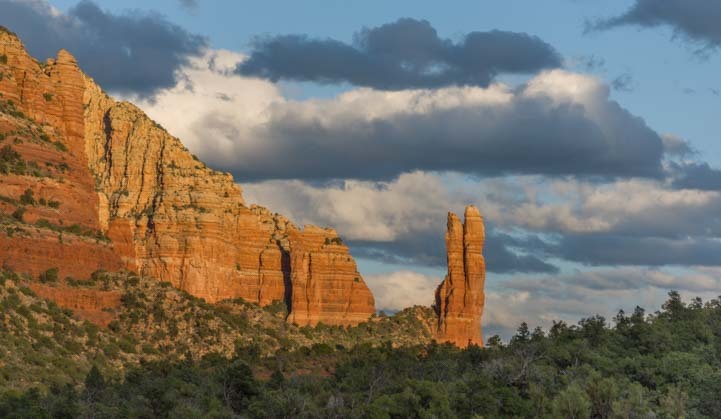 Definitely go back to Sedona if and when you can, but stick to I-17 and route 179 coming up from the south! !